The Public Affairs Office prepares and submits news releases on the activities of the Kansas National Guard, Kansas Division of Emergency management and Kansas Homeland Security to approximately 350 news organizations in Kansas, in addition to posting them on this Web site, Twitter and Facebook. The Public Affairs Office is the point of contact for information requests about the Kansas National Guard, Kansas Division of Emergency Management and Kansas Homeland Security, as well as arranging interviews with military and civilian personnel of these departments. The Public Affairs Office is also the lead state agency for news information during disaster emergencies. The Public Affairs Staff can provide public information support to local emergency management staff in times of disaster. This includes use of the Public Information/ Geographic Information Vehicle. The Public Affairs Office produces the Plains Guardian, the official newspaper of the Adjutant General's Department. The PAO also produces the agency's Annual Report, as well as brochures, training materials and other publications, as needed. Meet the staff of the Public Affairs Office. The Public Affairs Office receives requests for community assistance and submits them to the appropriate channels for approval. These requests may include guest speakers, static displays, military fly-overs, color guards, cannon salutes and other support. The Public Affairs Office provides news story coverage, video and still photography support for events related to the Kansas National Guard, Kansas Division of Emergency Management and Kansas Homeland Security. The Public Affairs Office has three full-time civilian staff and two full-time military staff members. There are additional full time military and M-Day (traditional) public affairs staff at Joint Forces Headquarters, 190th Air Refueling Wing, 184th Intelligence Wing and 35th Infantry Division. Video and audio files of Kansas National Guard activities and events may be accessed by going to the News Release page. Senior enlisted leaders of the Kansas National Guard meet in Topeka May 2 for a quarterly summit to discuss policy and other matters pertaining to the training and care of Soldiers and Airmen. Master Sgt. Jeremy Byers, command historian for the Kansas National Guard, moderates a group discussion on the 1968 Kansas National Guard mobilizations for the Vietnam War. The discussion took place during the quarterly Brown Bag Lunch at the Museum of the Kansas National Guard in Topeka. Spc. 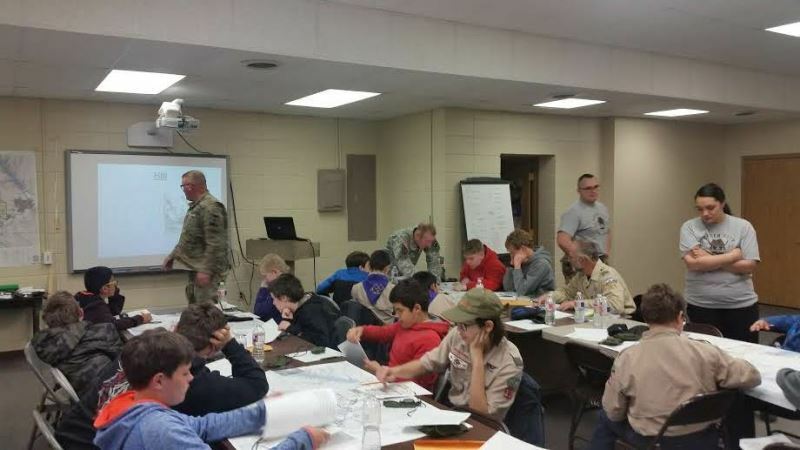 Allen Maisch, Task Force Broncbuster, gives a presentation on terrain features to members of Boy Scout Troops 108 and 59 and Garden City High School JROTC cadets. The presentation, assisted by Garden City Community College ROTC Cadets, was part of a community leadership event at Garden City Readiness Center April 7. This class prepared the Boy Scouts for a Land Navigation Course to complete requirements towards their Orienteering Merit Badge.